Most players are looking for that rubber that fits them just right. Nittaku has introduced the Fastarc series with a variety to choose from. 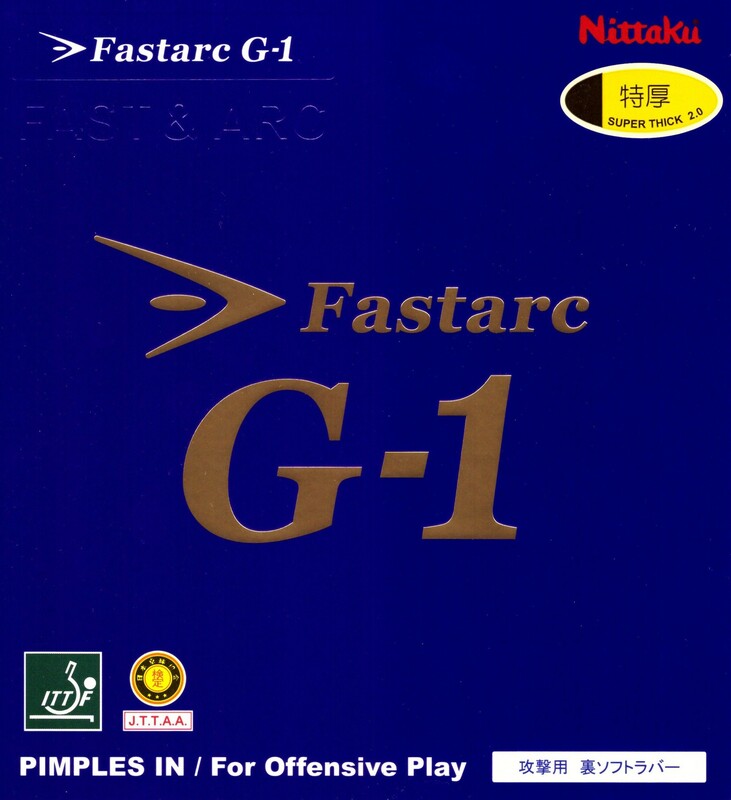 The Fastarc G-1 has the most power of the series. It's a very direct and to the point rubber. All offensive strokes from fast drives at the table to long distance counterlooping are executed with high precision. The hardest and fastest of all the Fastarcs. This rubber serves as a very stable high performance rubber in contrast to some of the modern tensor rubbers available on the market today which can change in playing characteristics in a relatively short period of time. In my experience, near daily usage for approximately 3 hours a day the topsheet and sponge provides a consistent experience for about a month. This includes multiball with some particularly dirty balls and not necessarily the most meticulous cleaning regimen. For a modern offensive game there's no particular field that this rubber is deficient in. If there's any nitpick then one could say the sponge is on the softer side lending to the rubber bottoming out more easily than others on flat shots or smashes. Whether looping at mid to long range or driving the ball close to the table, the rubber has a very linear feel compared to other rubbers in this class and is easy to understand from the get go. In comparison to other popular rubbers, it feels more inert than Tenergy which allows for easier short-short play. It still does maintain a springing feel with a lot of incoming energy being conserved which make emergency shots and short strokes easier to perform than with Hurricane3. As alluded to earlier, G1 sponge tends to maintain it's characteristics longer than Tibhar Evolution rubbers such as MX-P or EL-P.
Having gone through several sheets of G1, one oddity to note would be that the topsheet for red and black sheets do not have the same surface feeling. A rough description would be that the red topsheet feels a bit more "plasticky" while the black topsheet feels more pliable. This doesn't seem to affect the ball characteristics too much in normal play, but it's divergent enough to be able to determine which sheet I'm touching in a blindfolded test. Отличная накладка, достаточная скорость, хорошее сцепление, контроль все на уровне. Советую. After trying the Yasaka Mark IV, DHS Hurricane 2, Tibhar MX-P, and Butterfly Tenergy 80, I really like this rubber because of high spin, great pushing, and top spin attacks. I use it on the both sides of my blade. Perfect amount of hardness for forehand looping. I can get a lot of spin with this rubber. I used to use G1 and changed rasanter r50. The reason is that it lacks elasticity and speed. I use this on my BH and love it. Good speed, grip and control. Love the high throw angle because my BH is a more flatter shot. So the margin of error is higher. Very good rubber for the price. Fast and the spin is as expected. My game is improving because of this rubber. I switched from Hammond and Hammond Pro Alpha and have been VERY pleased with both G-1 and C-1 Fastarc. I use the G-1 on the backhand and the C-1 on the forehand. The sponge on the C-1 is a bit softer and results in a tad more spin. G-1 is still excellent for looping but is also fantastic for quick, flat, pick hitting, which is my backhand game. I have enough wrist on my backhand loop to still generate a lot of spin but have the flexibility to pick hit with it as well. C-1 I need on my forehand to help me generate more spin. Both are fantastic and seem to last well. Excellent control and fast speed. Very good balance. Very good and outstanding rubber for spinning players. This rubber is similar to Tibhar MX-P. No great difference. Low throw than Tibhar MX-P. Control is good. Speed is good for putting away winners. Block depends on blade, but low throw can cause you to fall inside your net. I would rate it 9/10. No change after playing for 1 month, so I think it is durable. This rubber is one of the best rubbers to create spin. It's fast with outstanding control. Very good on both sides of your paddle. It's very good. I want super thick version. If possible, tell me. Tenergy 05 is very expensive. I love the G-1 ! One of the best rubber that I have used. Can execute powerful forehand and excellent control. G-1 is the top rubber with good spin. It is cheap and light. It's my best rubber. Great for chopping and returning serves. Great for backspin serves too. My favorite rubber. Excellent grip as the name says. Also, control very good. This is one of my favorite FH rubber, very high spin potential and excellent surface grip, this rubber plays similar to Tibhar MX-P with more control and higher throw. It is a very good backhand rubber and last longer than Razka 7. 09/01/2019 Excellent Review by Gary S.
This rubber has very good control and speed. Excellent as always. Very durable. This is an excellent rubber for those intermediate players who want to improve their forehand repertoire. It sacrifices a bit of speed to gain control and as an off player I can say this rubber has made me improve all forehand strikes. The feels just like Tenergy. Good for offensive play. Speed and spin is superb. Can control the game smashes and top spins. Once you get the grip of the rubber, it's just perfect. Just as the name says, it is fast and has a high arc. Can vary with just amount of spin and push. Great rubber for intermediate to advance level players who want something like T05 but less speed more control and is useful for developing technique (particularly loops)"
Excellent rubbers if you need control more than speed. But you have enough speed to kill the point with good technique. Offers a lot of gears, very good in short game, great touch. This is great if you find T05 too sensitive to spin. Can also generate amazing spin. Open-ups are easy. Dwell time is also great. Use it on Tenor or Acoustic. 14/09/2018 Very good. Lasts a long time. Review by M.A. One of the best rubbers in the market last a long time. Excellent spin, very good on plastic balls, not heavy; suits forehand and backhand and not bouncy as Tenergy. Higher throw then MXP and Bluefire better then new Aurus Rasanter and Joola. One of the legendary rubbers from ESN. It's like a Tenergy 05 with 75% stickiness of Chinese rubbers. I have pasted it on XVT ZL KOTO. I have used Omega IV PRO and Rakza 7 with Carbo 7.6 in the past. Hence I am comparing Fastarc G1 with these rubbers. Throw angle of Fastarc is better than these 2 rubbers. Provides good clearance over the net. Spin in slightly better Rakza 7. Hardness is same as Rakza 7. 5% slower than Omega IV PRO. 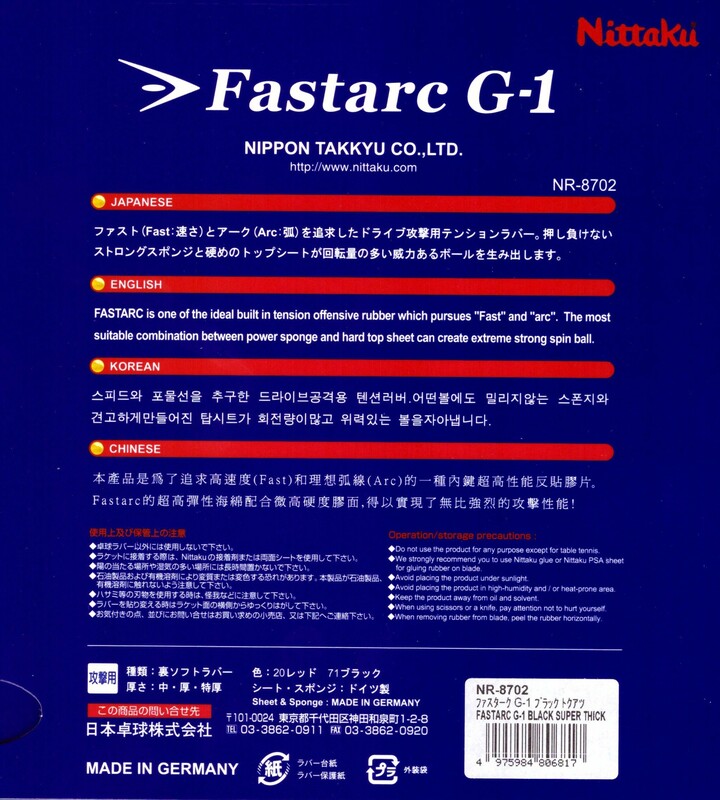 In short Rakza 7 + better throw angle + better grip = Fastarc G1. It is only a week since i have started using hence cannot comment on durability. Overall very very good rubber. Отличная и цепкая накладка, скорость достаточная. Very good both on wood and composite blades. Very durable. Rubber have a nice spin, not very fast and small catapult. 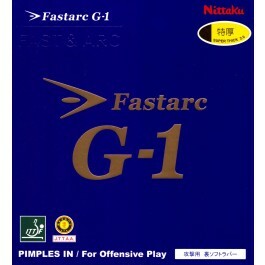 Use Fastarc G-1 for FH on Nittaku Latika - really liked spin. This rubber has high spin for a good arc and decent speed, however not as fast as the evolution MX-P that I use on my other side. It is overall a decent rubber however I had a lot of trouble dealing with incoming spin on my backhand because it reacts VERY strongly to spin. Backspins became much more difficult to lift. Solid feeling and control. Gives a very predictable and consistent feedback to the user. Well adapted to offensive topspin play style. Durability is also a strong point. Generally will end up replacing once a month playing around 15 hours a week. Have noticed that the top sheet for the red rubbers have notably less grip compared to the black sheets. Great rubber for loops and serves. Very good rubber feels like the MXS, but a little more controllable. Поиграв несколькими тензорами, решил, что наверное это не моё. Мешала катапульта. Так и думал, пока не попробовал эту накладку. Очень контрольная катапульта, цепкий топшит, вариативна (можно использовать как справа, так и слева, у меня в основном слева), маловосприимчива к приходящему вращению, легко контролировать скорость, линейна и предсказуема. В общем, очень много плюсов. Менять буду наверное только на неё. Great value for this product. I've used it as a nice all around sponge. Love this rubber. I'm using Black Super Thick 2.0 on a Nittaku C-SZ. It has good grip for lifting. Not very spin sensitive. Excellent touch for the short game. Enough power away from the table. I'm simply landing more good quality shots on the table than ever before with it. The rubber is now my preferred forehand rubber. I've tried hurricane/skyline, tenergys, MXP, rakza, and some other popular rubbers, but this one is considerably cheaper (especially if on sale) and has the best qualities from all the rubbers mentioned above. It has a pretty tacky topsheet (less than hurricane, but definitely more than tenergy), powerful sponge (harder than rakza, softer than hurricane, similar to tenergy), and lasts around the same time as most tensors. It allows great spin when needed as you can feel the topsheet clicking with the ball and also shoots the ball out with great speed; it's really like a hurricane topsheet with a tenergy sponge. Great for both loops drives and softer spin loops. Smashing can also be performed with good technique. When the rubber gets too old, it still feels grippy when you touch it, but when playing the ball tends to slip a lot more and loses the spinniness it once had. I would recommend it to people with developed technique because it provides enough power/spin if you stroke the ball correctly and performs well in every field. You can't really blame this rubber if you miss because it does everything it should: lifts underspin, allows topspin loop drive, spin loops, pushes with good spin, short game is fine, flips are easy, serve receive is easy (much easier than tenergy imo), every ball clicks into the rubber/topsheet easily, etc. Overall a great offensive rubber that performs as it should and really allows you to swing into your loops because of its tackiness and springy sponge. Really love the price and quality! Can be a bit brittle around the edges and loses grip after a couple months, but it's still playable after this and shouldn't be thrown away. Boost it after it gets old and slap it on a spare paddle and it still plays pretty well. Samson Dubina recommended this rubber and I am pleased that I seriously considered his suggestion and bought the G-1 red and black rubbers in Max sponge. Plenty of tack to brush the ball back to your opponent, even from off the table and low. The grip is just insane. Love it! Spin is top notch. This rubber is also loaded with speed. When max sponge is activated, your opponent had better be fast to respond to your attack due to the immense speed created with this rubber, especially if you're using a carbon blade in combination with the G-1's. If you have a forehand rubber that you would rather use instead of the black G-1, please note that the red G-1 is stellar as a backhand rubber. I contend that the G-1 red is a better backhand rubber than the Tenergy 05. It has the same spongey feeling but there is just more to the feel of it than the T05. Personally, I will keep a blade with G-1's on both sides and another blade with Nittaku's (DHS) Hurricane 3 on FH with G-1 red on BH. All bases covered. One cannot go wrong. Really fast rubber. Hard feel (sponge and topsheet). Playing modern defense, it's suited for countering at mid distances but it's too fast for short game and chopping. Grip is surprisingly good (black rubber). Its a good rubber. I use it on forehand. Fast, spinny rubber with an acceptable short game. Performs most shots well. A little too hard and high throw for my backhand but great for the forehand. A great choice for offensive players who are undecided on an all purpose attacking rubber. Great price point too so I can see why it's a best seller in Japan. On all 3 of my Violins and Accoustic, both FH & BH. Perfect balance of speed, spin and control. It is relatively light in weight as well. If there is one criticism - it is not as durable as I would like. I bought a high-quality product at a low price. Delivery is also fast and convenient. behaves all right but difficult to judge due to a slower than expected blade. Good rubber from Nittaku. I've enjoy Fastarc S-1 for few years, this one comes in very close. I'm using this rubber on my forehand and find it has very good top and side spin. Smashing from mid distance was very good. appropriate for spinning and speed. I'd like to make a suggestion for all the players, especially for high level player. Thank you. This was an upgrade on the FH side of my Xiom Vega Tour from Omega IV Elite. I was looking for more speed and spin, and this rubber delivered on both counts. It has a relatively firm sponge, but the rubber grips well and loops and drives were easy to execute. A good shot is accompanied by a nice click. Pretty nice rubber actually. It seems less springy than say T05 or M1. Maybe the sponge is harder. If you brush the ball finely it will be loaded with spin. It's also quite fast for flat hits or fast loops. Used on a carbon blade. This is a phenomenal offensive backhand rubber. For forehand I personally prefer Tenergy 05 or Tenergy 05 fx. Use not much haevy and too hard blade (approximately 85 grams). A good choice is Timo Boll ALC, Joola Markovic (the new name is Rosskopf Emotion), or for example in my opinion unjustly neglected Joola Sheik (75 grams). Very good quality. Very grippy and spiny. Very good feel and control. Take time to understand its behaviour. It will get better when you can connect with it. Had this rubber for forehand on my viscaria. Spinny but too slow. From the look, feel, and daily playing experience, it seems pretty durable as well !! Totally satisfied !! Highly recommended !! I m using it as FH on DHS long 5 blade, with Fastarc C-1 on BH. Great combination. I have used different rubbers but this rubber is superb execellent and have lots of spin and control especially for long distances loopers. Good price and fast delievery. good rubber, excellent short game. I tried this product for my forehand for one month with Stiga sense 7.6. not as good as butterfly 05 with butterfly blade though. But it would be a good rubber if you hit the ball quite often. If you have 50 euro pls choose butterfly 05 instead. It would be a nice choice if it is used for backhand. A great attacking rubber. I am a die hard looper, and this is not exactly for the slow, super-spinny ones, but for everything else. Again, work great on both sipes. Most excellent away from the table. a monster out there. The perfect quality of the rubber straps on the tennis rackets, quick delivery and definitely will order again. Recommend everyone! Has very good speed & spin. I have 1.8 & 2.0mm on my BH. Feels a little hard at beginning. It takes some time to get used to. After that, it works like a monster. Very explosive. sticky and fast looping rubber. great quality and great value. Fast and spiny. for your information, the rubber feels harder than the C1 and S1. Can be used for the forehand and backhand, but I find it to be better for the forehand. In the last 10 years, i have played vom Butterfly sriver, over Butterfly Bryce an Ternergy. But now, this rubber is greatfull in quality, control, spin and speed. I use it in super thick on my forehand on a Joola Chen Wexing blade. The service, chop, and 1st ball are so controlled with so much spin, that i can open the game with a very good topsin. I have played the first rubber over 4 month and he is actually Ok. Butterfly Tenergy was over 7 weeks very weak. My top spin far away from the table has always been low and it lands at the net frequently. with this rubber, the ball is now landing on the table more often. the throw angle is fantastic, and spin is great and the speed is just right. Tried this as an alternative to Tenergy 05 (which I beleive has a much inflated price). It has a better short game than T05 and there is less of a "bounce" feel, so you get the feeling of more control. I found that it doesn't generate quite as much spin on very thin contacts but is just as good on thicker contact loops. In all I think I prefer it (though T05 is still a great rubber) and use it both backhand and forehand on my Nittaku Violin. So... if you want to try a fast and spinney rubber thats not as pricey as T05, give this a try and you won't be dissapoined. This rubber is good for spin and controlled loops. Didn't seem very powerful on driving but over all is a good rubber. A very expensive rubber, but thats ok, because the quality is way up there! Speed, control and spin is out of this world. Durable as hell! It's got lots of speed and spin. I recommend it highly.